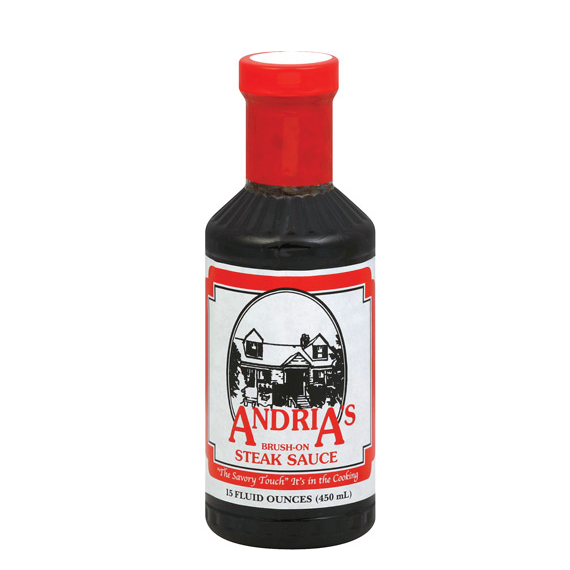 Andria's Brush-On Steak Sauce was created by Sam Andria when he opened the award winning restaurant in O'Fallon, IL. in 1978. The sauce soon set the steakhouse in a class by itself. Although its use on beef and pork dishes established its unique flavor, its versitility was quickly recognized. We moved from St. Louis a few years and cannot buy Andria's Steak Sauce where we live now. I have a brisket recipe that calls for this. I searched on line was surprised that Straub's offers an online store, so I ordered 2 bottles. I asked for delayed shipment since I was going to be out of town. The order arrived right on time and was very well packed. Can't add too much about Andria's - it is very good and now a have a supply that will last awhile. As a Transplant from the St. Louis Area I couldn't possibly start the fast-approaching BBQ Season with out my old favorite. Your on-line purchase process was quick and easy and delivery was on time! Great Service.